Determining which jurisdiction to file in – how do you make the call? Can you have proceedings in multiple jurisdictions? How can Australian orders be given affect in overseas jurisdictions? How can overseas orders be given affect in Australia? Amy Sanders-Robbins is Director of Bespoke Family Lawyers in Brisbane and an Accredited Family Law Specialist. 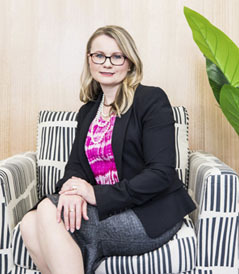 Amy is also a Collaborative Family Lawyer and a member of the Queensland Law Society Family Law Committee which advocates for family lawyers in Queensland and family law legislative reform. Amy practices in complex property and parenting matters and has developed an expertise in international property matters. Amy has built a reputation around her holistic approach to family law which sees her and her team at Bespoke Family Lawyers delivering legal solutions, while also addressing and working with clients on the broader life and social issues impacting them during separation and beyond.